Trembling with excitement, the horses race ahead. THERE was a time when antique furniture had to be old, really genuinely old. Now it is easy to buy brand-new furniture in a ‘distressed’ state. That is to say that it is made to look old: a bit of paint rubbed off on the corners, a few wormholes made with a very narrow drill-bit, the odd light scratch or two. Once if we bought a new piece of furniture and it looked like that we should either have sent it back to the shop or expected a heavy discount off the price. Today it can be seen as added value: an instant antique. Many people like the idea of the instant – instant meals, instant e mails, instant music and films on hand-held devices; so why not instant antiques? Some people want their faith to be instant – low input, low cost, low maintenance. But faith is just not like that. Like love it takes time to mature. Like love it is tested by the knocks and blows that happen to us all. Like love it also deepens as the days go by, always providing that, like love, it receives the attention and support that it needs. Faith is not a sudden, blinding flash of awareness of the truth, although that sort of experience may well be the beginning of a person’s journey towards faith, or push it forward. Faith is more of a relationship with the person of Jesus Christ. It is the sort of relationship that grows until life would be quite unthinkable without that bond, that trust, that knowledge of the other. As with other, human, relationships our relationship with God takes time to build to become faith. The Bible shows us how God’s people often had to wait: the Hebrews did not enter the Promised Land overnight nor did the waters of the Flood recede to allow the land to dry out instantly. Jesus called many to follow him but the rich young man was not ready to give up his riches; the blind man at Bethsaida had an encounter with Jesus, but he still had to wait for Jesus’s hands to be placed upon his eyes a second time before he could truly see. It looks as though Lent will be full of activity time this year. The preparations for the Passion Play have to continue, there are Lent Groups being organized and the Alpha Course to be planned. The work of bringing our Team together with a shared vision and a common goal goes on. Nothing is truly instant, it all takes time to come to completion. Our faith in God and our relationship with Christ Jesus deserve no less than a lifetime to mature. Even in a busy Lent it is worth our allowing time for faith to grow and deepen and mature. Last month’s photograph of St Mary’s nestling in the trees has generated quite a lot of speculation, including the suggestion that Edward must have been hang-gliding! No, he was standing on the hillside roughly midway between Piccadilly Farm and The Hewletts and took the photograph using a 100-400 telephoto lens. You can possibly see from the church clock (it’s clearer in the colour photo on the parish website, www.prestbury.net, than on the printed magazine) that it was about 12.50pm, and you may be able to make out the tents on the racecourse in the far distance. The picture was taken on 29th August 2005 and Greenbelt was in full swing. If you have a suitable photograph of somewhere within Prestbury parish and would like me to consider it for publication sometime, do let me know. Digital photos are obviously easier for me to deal with, but I can scan printed ones. SUNDAY 1st February saw the launch of the Year of the Child. 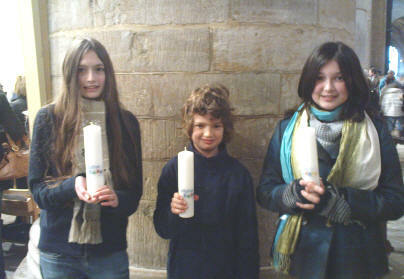 Tewkesbury Abbey was filled with the smiling and excited faces of many children as they gathered together in worship. The procession of bright Sunday School/Club banners led in Bishop Michael who was accompanied by Archdeacon Hedley, Sandra Millar, the Children’s officer, and special guest Rev’d Mary Hawes, the National Children’s Advisor. Also being launched was the ‘Shine a Light’ challenge. 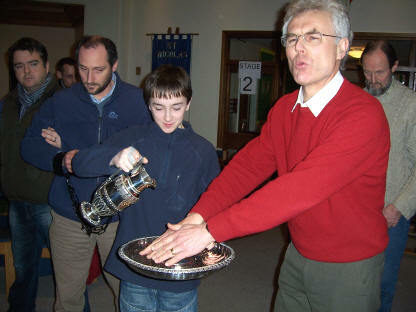 Every benefice was given a special candle, a prayer and a challenge! The idea is that you light the candle and say the prayer with as many different groups of children as possible. We were fortunate to be able to claim a candle for each Church in our Team. Over the coming weeks and months our candles will be lit in our churches to remind us to be lights in our communities. They will also be taken out to be lit where we connect with children in our communities. Children from our team took part in the procession and collected candles. Watch this space for more information about the Year of the Child. PRESTBURY St Mary’s C of E Junior School will have vacancies on the Governing Body for foundation governors, starting their four-year term of office from 1st September 2009. As outlined in the March 2008 edition of this magazine, foundation governors are nominated by the PCC and appointed by the Gloucester Diocesan Board of Education. Their particular responsibility is to celebrate and foster the Christian Ethos within the school which, alongside quality education, ‘offers a spiritual dimension to the lives of young people, within the traditions of the Church of England in an increasingly secular world’ (from The Way Ahead: Church of England schools in the new millennium). If you are interested in applying for this opportunity to serve one of your local schools, please contact Fr Michael. Applications will need to be received by the end of April. As you may already be aware Prestbury & Pittville Youth has received generous funding to run a project called ‘The Great Outdoors’. This project is focusing on the environment, wildlife, outdoor activities and healthy lifestyles. The project (like previous projects such as Re:create, Challenge 07 and Our Voice) will run across all the different groups. Each group will have its own take on the project whilst also coming together to inspire each other and pool resources and ideas. One of the great things which involvement in the outdoors brings, in my experience, is the sense of awe for our creator God. God’s creation is something which must not be taken for granted. It is beautiful and dangerous, fragile and life-giving. Another of the things we long for within the project is a sense of adventure – the confidence to take risks, to work together to achieve tough challenges and to be able to catch your breath and survey the view when you reach ‘the summit’. Activities planned so far include: an outdoor activity weekend at Viney Hill, bird feeder making, local community clearance work, outdoor cooking, an ‘environmental prayer labyrinth’, hiking, wildlife days, bike maintenance and much more. We are looking for local environmental projects for groups to be involved with as well as local volunteers who may have expertise they can share. Please do get in touch with Andy Macauly (520534) if you feel you can help. The speakers (on CD, not live!) include The Bishop of Durham, the Abbot of Worth Abbey and the writer and broadcaster Anne Atkins. There will be an accompanying booklet and to cover costs we will be charging £5 per person for the whole course. If you haven’t already signed up, please do so as soon as possible, or ring the Team Office (244373) on any weekday morning between 9am and 12 noon. Provisional times and venues are listed in the next column. Please see the pewsheets for confirmation of these. Some of you may have heard that we were hoping to use a study course based on the writings of C S Lewis. Unfortunately that course required every group to have access to two DVDs or videos. These have proved difficult to source and also would be quite fiddly to use. We hope we might be able to make use of it on another occasion. On Sunday 29th March the Bishop of Gloucester will be making a pastoral visit to the North Cheltenham Team Ministry. At the time of going to press his programme has not been finalised; however we anticipate that he will wish to take up as many opportunities as possible to participate in the life of our Team Ministry on that day. SUNDAY 18th January this year was a significant day in the life of the Prestbury Ministry Leadership Team, as we said goodbye and thank you to John Elliott, who had decided that the moment was right for him to retire from the MLT. The Team are sorry to see John go, and will miss his patient wisdom and his ready sense of humour, often directed at himself. We are so grateful for all that he has contributed to the work and fellowship of the Team, and for all that he continues to contribute to the life of the church here. Although inevitably some of the clergy members of the Team have moved on over the years, John’s departure is significant as the first change in lay membership since the Team was mandated by the Bishop of Gloucester in 2002. This is therefore an opportunity to think about the future shape of the Team and in particular the selection of one or more new lay members. Those with long memories will remember that everyone on the parish electoral roll was invited to share with the PCC and the parish clergy in selecting the original Team. Although you will be hearing a lot more about the process in the coming weeks and months, it is not too soon to start thinking about possible new members of the MLT. As a reminder, the MLT was set up as ‘a team of lay and ordained people working in partnership to lead, co-ordinate and develop the ministry and mission of all in order to build up the worshipping, witnessing body of Christ locally’, so very much about the Team members enabling the ministry of others, rather than doing it all themselves (though of course they do some of it themselves too). Please do keep the work of the MLT and the selection of new members in your prayers. DURING the Eucharist with a Difference at St Nicolas’ on Sunday 8th February Fr Michael dedicated new vestments and an altar frontal in memory of Eileen and David Jones. The vestments, green for use in ordinary time, were purchased with money bequeathed by Eileen, a warden at St Nicolas’ for many years, who died in 2005, and her son, David, who died the following year. There was also enough money to purchase an aspergillum. Fr Michael did not wish, however, to sprinkle the new vestments! He said the aspergillum would be useful at funerals. Instead of a sermon Fr David reminded us why we use vestments and altar frontals. IN OUR churches in Prestbury and in All Saints’ our preparation for the Eucharist involves dressing the altar and the clergy in particular ways. At February’s Eucharist With A Difference at St Nicolas’ church, we took the opportunity to think about why we do what we do. Each season of the church year has a colour associated with it: white or gold for celebrations of saints or at Christmas and Easter; red for feasts of martyred saints or for the Holy Spirit; purple for times of anticipation and preparation, especially Lent and Advent. Between these times of year, in ordinary time, we use green, signifying growth and the hope we find in our Saviour. The altar is the focal point of the Eucharist: the place where we remember the Last Supper of Christ. It is at the altar that our earthly offerings of bread and wine meet with Christ’s divine offering of himself for our sins. Such a significant act demands careful preparation of the altar. Words alone are insufficient to the purpose, so we use our other senses as well: to engage our sight the white cloth on top of the altar represents purity and holiness and we also hang a coloured frontal to indicate the season. In Exodus 28, God commands Moses to make vestments for those who enter God’s presence, not for their own importance, but to glorify God. What we wear is somewhat simpler, but is worn for similar reasons. The alb is the basic Eucharistic robe. One of the oldest forms of liturgical clothing, it is descended from the simple linen tunic worn by everyday Romans, especially slaves. It is usually white, representing the holiness of the Eucharist and, because white is the colour associated with Christ’s grave-clothes and the robes of the martyrs in Revelation, white also symbolises resurrection. As a piece of uniform, the alb highlights the significance of the sacrament over the importance of the individual wearing it. By wearing the alb, a person indicates his or her readiness to serve at the Lord’s table. Many traditions surround the origins of the stole. Most popular is that the stole is a descendant of the work cloth slaves wore around their necks, the kind of towel Christ used at the washing of his disciples’ feet. It is therefore sometimes referred to as ‘the yoke of Christ,’ the yoke of service of ordained ministry. Wearing the stole indicates a priest’s willingness to enter into the ministry of Christ, serving God and the community, including preaching, caring for the sick, and presiding at the sacraments. The deacon’s stole is very similar to the priest’s stole, with similar meanings to it, save that it is worn crossed to one side. This denotes the difference of role between a deacon and a priest: where a priest is leader and servant to the whole community, the deacon is charged to assist the priest in the liturgy, to preach the Gospel within and outwith services, to care for the sick, to bring candidates to baptism and to pray for those in need. The chasuble is worn by the priest presiding at the Eucharist. It also is a very ancient piece of liturgical garb. Paul asks for his in the second letter to Timothy, written shortly before his martyrdom: ‘When you come, bring the cloak that I left with Carpus at Troas.’ Wearing the chasuble, therefore, signifies willingness to follow Christ, even to death. THOSE of you who read the December issue will remember that a group from different Churches in the Team took part in something called ‘Alpha’ last term. This was partly out of personal interest, but also to see what running a course would involve. Since then there have been two very positive planning meetings and we are now on track to start an Alpha Course shortly after Easter. The Alpha Course first started 26 years ago at Holy Trinity, Brompton (central London). Its purpose was, and is, to present the basic principles of the Christian faith to people in a relaxed and informal setting. At first offered only to Church-goers, the course was adapted in the early 1990s by the Curate of Holy Trinity, former barrister Nicky Gumbel, who saw its potential for sharing Christian beliefs with those who did not go to Church. From this time on the popularity of the course grew and it quickly began to be used not only in parishes but also in prisons, hospitals, work places and the armed forces. Today there are over 33,500 courses worldwide in 163 countries and it is supported by all the major denominations. In order to introduce the course to people the first thing is to invite them to an ‘Alpha Supper’. Coming to the supper doesn’t oblige anyone to attend the course, but it does provide an opportunity to hear about what the course involves and to think about whether to give it a try. No-one is pressurized to make a decision there and then, as the course usually begins a week or two later on, it is free to attend, and anyone can drop out any time. 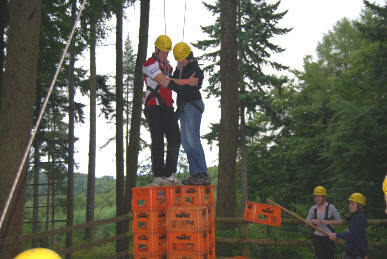 The course itself lasts ten weeks, sessions usually taking place on a weekday evening. The group (about 6 to 12 people) meets in someone’s home, shares a meal, hears a talk and then spends some time discussing and asking questions. Some of these groups can be very lively; others are quiet and thoughtful. Every group is different and there are very few ‘rules’. No question is considered too simple, or indeed too complicated, to be brought to the discussion and no-one is put under pressure to ‘conform’ or to share anything they do not want to. About halfway through the course there is an additional day or weekend away, allowing extra ‘space’ to reflect on your own life in the light of what has been covered. At the end of the course (or, more likely, in September) there will be another chance to gather together, this time for a ‘Celebration Supper’, where those who have been on the course can share their experiences. And, naturally, this could be the start of the next course for a whole new set of people! Although we now have enough people to lead groups, it is still not too late to get involved. Would you be prepared to spend some time in prayer for Alpha each week? Or could you help by preparing one of the meals or the Alpha Supper? We are also on the lookout for places to meet: would you be willing to have a group meet in your living room one evening a week between Easter and the Summer holidays? If the answer to any of these is yes, please let me know (and do not be afraid to say you would like to work with someone else – I am very keen that no-one should be over-burdened). REHEARSALS for this year’s Passion Play are well underway every Wednesday evening at St Nicolas’ Church under the direction of Daphne Philpot. In the picture you can see Pilate (David Lyle) just after he condemned Jesus (Mark Jackson). We are still short of a few men, so please volunteer yourself or someone else for a non-speaking part. The cost of putting on the play has risen. The scaffolding we use will cost us more this time as we need to rely on professionals to erect the stages. We anticipate the costs will exceed £800. We have received some donations and the proceeds of the Epiphany Supper towards this. Entry to the play will be free and all of the retiring collection will be given to charity. Perhaps you could help by holding a sale, or a sponsored event or a coffee morning? IT SNOWED quite a lot at the start of February and the entire country ground to a halt – you may remember… Except we are made of sterner stuff in North Cheltenham and as conditions had eased there was no way that the remaining bit of crystallised water was going to stop the 6th Parish Quiz night from taking place. Twelve teams convened at St Nicolas’ Hall for an evening that set out to raise much needed funds for Prestbury and Pittville Youth in a relaxed and fun way by doing what we all naturally do best – enjoy each other’s company and get to know others we had not met before. In short, this is fellowship in its most basic form. There were three rounds in each half, a ‘first ever’ round, a question round and a picture round. The questions journeyed from simple to obscure with various stops at tricky, guess and ‘50/50’. For the first time Sponge Bob Square Pants shared the limelight with Barack Obama and nobody was surprised. 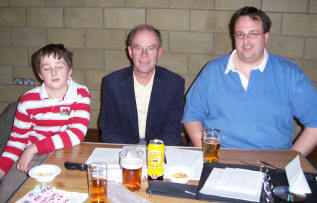 At ‘half time’ while everyone refuelled at the bar the work of PPY was showcased on the big screen and a raffle was held, expertly compered and drawn by Father David and Sarah and eagerly anticipated by those who had bought what they hoped was the ticket to win the ‘big prize’. In the end the team calling themselves ‘Acorn Antiques’ won through (I’m not sure who Mrs Overall was…) to claim the spoils, and the award for the best team name went to ‘3 Blondes and a Simon’. The evening raised a total of £141, which will go straight to Prestbury and Pittville Youth to help them continue their fantastic work with the young people of this area. All that remains is to extend a huge Thank You to those who came along and made the evening such a success and also to everyone who helped behind the scenes to organise everything. The Bricks spent several hours devising questions to ask us and when they looked at the weather they wondered if it had been worth it. They need not have worried – 40 people more than expected braved the snow to pit their wits! We were told the questions were for all ages, and they were. To be successful you needed to have watched a lot of television, kept your eyes open when out and about, and have a youngster in your team. Acorn Antiques (Janet, Mavis and Gill) were the winners, hotly followed by Michael’s Muppets. 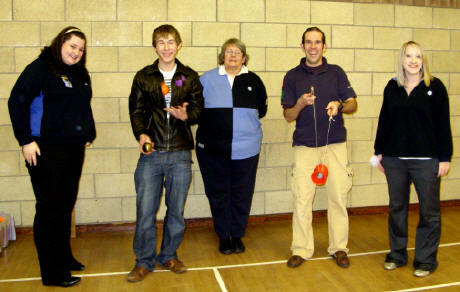 £141 was raised for Prestbury and Pittville Youth. THE VARIOUS mission areas established during the ‘mapping’ exercise reported on their activities. Because we in North Cheltenham had already embarked on discussions before Bishop Michael’s Initiative we are now a long way ahead of the other areas, but they are moving forward in various interesting ways. 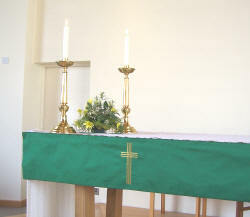 We are also fortunate in that our styles of worship in our five churches are not vastly different, but the East Cheltenham Group have a very wide range of worship so they have decided to work together in the areas of Marriage and Baptism in which they can, of course, share ideas very happily. The South team reported that St Christopher’s and the United Reformed Church of Warden Hill are involved in developing a Local Ecumenical Project, meeting regularly in each other’s churches for worship, and have planned a week of combined prayer for Holy Week. Canon Andrew Dow, our Area Dean, spoke on the subject of ‘street pastors’ and requested that his article (see below) be published in Parish Magazines. Please do read it because it seems to be a practical and gentle approach to an ugly problem. It also works, according to police in areas where it is used. Andrew Dow also commented that older people particularly were successful in defusing scenes because they were seen as a proxy ‘uncle’ or ‘aunt’ or grandparental shoulder to cry on. Please everybody, instead of moaning about ‘these kids’, think hard and help. The aim is to encourage children to do things and work things out for themselves – they are human beings with emotions and brains like ourselves – don’t be tempted to simply entertain and spoonfeed. Spare time to talk and listen to them as well. The final part of the meeting was a description of life as a hospital chaplain by the Revd Katie McClure, chaplain at Cheltenham General and Delancey Hospitals. We were all saddened to realise what a politically correct minefield she must work in even though her ministry is obviously much needed and appreciated. Spare her some moments in your prayers. Her message for all of us present to pass on to you is this, and it is very important. If you, or a member of your family, are admitted to hospital anywhere, make sure that the hospital is officially informed that you would like to be visited by the hospital chaplain and clergy from your parish. If you do not do this, none of our clergy, nor Katie McClure, is allowed to visit you. So is this not a very serious and sobering thought? 1 “Street Pastors” is an umbrella name for a Christian ministry that has started up in several UK towns and cities in the UK since its inception in London in 2003. 2 “Street Pastors” usually involves trained Christian, local church backed, volunteers going out in pairs on the streets of town and city centres on Friday and Saturday nights between 10.00pm and 4.00am, the busiest hours of the “night economy”. 3 Their aim is to act as a “calming “presence, thus diffusing potential flash points, and so indirectly leading to a reduction of violence and other crimes. They are also often called to give practical assistance, such as helping people to find a taxi, offering water, and handing out flipflops to those who having lost shoes, risk foot injuries from broken glass. 4 Each pair is in regular touch with local police patrols, and also usually with at least two people praying at the local “base”- often a town centre church. 5 The police – nationally and locally – are very supportive of the scheme because in almost every case, crime figures in the bars and night club areas have dropped considerably. The ministry therefore really is being “salt and light” in the community. 1 A group of highly motivated lay people from two or three different Cheltenham Churches are very keen to invite the Ascension Trust to a public meeting sometime later this year. (There is a similar parallel hope for Gloucester). It is hoped that enough church members who show interest would then volunteer for the required training, and also that sufficient funds would be realised, or promised, to launch the project. 2 The senior ministers of several Christian denominations in our town have met, under my coordination, two or three times to discuss the scheme and try to work out the best way forward. We are basically very supportive of the project, but concerned that the right mechanism be found for setting up a sound Management Team, with the appropriate overall leaders. 3 We are currently awaiting the completion of a Feasibility Study being undertaken by the Rev Barbara Bridges (under the auspices of Gloucestershire Churches Together). Barbara will be reporting back to an open meeting on Wednesday 18 March at the Cheltenham Salvation Army Citadel, 7.15pm – 9.15pm. I shall be circulating all the town’s church leaders about this, but please do let it be known in your churches, and come yourselves if interested. The Annual Parish Meeting will be held on 26th April 2009 at 6.30pm in St Nicolas’ Church. For you to ‘have a voice’ at the meeting or to be eligible to be elected to an office you need to be on the church’s Electoral Roll (not to be confused with the Parliamentary Electoral Roll). Each year the Electoral Roll needs to be revised ahead of the meeting and this will take place beginning 8th April 2009 and will take effect from 11th April 2009. After this date no further names may be added to the Roll until after the annual meeting. Jesus has power over wind and sea; his disciples are amazed and frightened. Later in the chapter, Luke will go on to tell of Jesus’ authority over demons, over sickness, and even over life and death. At the heart of the story is the revelation of Jesus as Lord, and we rightly treasure it for its assurance that Jesus is ever powerful to still the storms in our own lives. For a moment, though, consider the end of the passage. ‘Where is your faith?’ says Jesus to his terrified companions. Poor disciples! So often they are slow and fail to understand, and we hardly notice Jesus’s reproof. But I wonder, that day on the lake, how would he have wanted them to react? Should they have known that no harm could come to them with Jesus the anointed one? Or that he himself would keep them safe (even asleep)? Two good answers, surely. Or should they have met calmly whatever happened, knowing they were in God’s hands? (But on other occasions Jesus did not expect superhuman indifference.) Should they simply have rowed harder? Or even, should they have stilled the storm themselves? Is that too daring a possibility to consider? We can find some encouragement to think on these lines. Immediately after Luke has completed his demonstration of the universal authority of Jesus, he tells at the start of chapter 9 how Jesus calls the twelve, gives them power and authority over all demons and to cure diseases, and sends them out to preach and to heal. Here and elsewhere in the gospels he seems constantly to ask the disciples to run before they could walk. Supremely, he goes to his death leaving the fate of his church to this unsatisfactory group of men, who seem rarely to have understood his message, and certainly deserted him at the end. The gospels are there for every Christian, in every generation, but the writers were men of their own generation and were especially aware of their contemporaries. Persecution was an ever-present danger for the Christians then, and as they read about the disciples with Jesus in the storm, they would have understood that they need not fear the persecution of the world. The Lord was present in his church and it would not be destroyed. But trust didn’t mean inaction: they persevered in worship and prayer, cared for each other, wrestled with serious disagreements, spread the gospel. We can see ourselves with the disciples in the boat; the storms are real for us as for them, like them we are amazed at the stature and authority of Jesus. How does he want us to react? Perhaps the answer includes all the possibilities above. Trust that Jesus Christ is able to save, confidence that we cannot fall out of the care of God even if the worst happens. And also readiness to respond to the trust Jesus places in each one, and not hold back from taking on the task that is mine and no one else’s. NB these are all subject to sufficient people signing up to attend. Please see the pewsheet for confirmation of which groups will be running (we hope they all will!). This group meets fortnightly on Tuesday evenings between 8.00 and 9.00pm. As well as praying about a variety of things within and outside the group, there is also the opportunity to chat and have coffee. This month we meet on Tuesdays 10th and 24th March. If you would like more information, please get in touch with Father Daniel or Anne Nicholson. The proceeds of the January bakestall enabled us to send £30 to The Smile Train, a charity which provides cleft surgery for young children in poor countries. Even better, this amount will be equally matched by one of their generous supporters. Similarly Care International will benefit from the European Union scheme when we contribute money in February/March. Sunday 15th March is the date for out next bakestall by courtesy of the A-F team. We shall be, as ever, most grateful for your support. Francesca Tolond was our speaker in January. 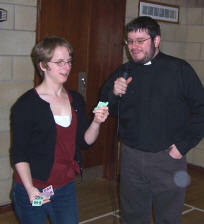 Francesca is employed by Gloucester Diocese as the Assistant Social Responsibility Officer, working with Adrian Slade. Her work involves working with the most vulnerable people within the City of Gloucester: the homeless, alcoholics, drug addicts, in fact, the very people that we may find the hardest to react with. As well as night work with soup kitchens and Night Stop accommodation etc she also provides items necessary to some of these people, many of whom have only the clothes they stand up in. Our MU ‘Challenge for Lent’, which can also be taken up by anyone else in our congregations, is to provide as many toiletries as we can for these people. There will be boxes in St Mary’s and St Nicolas’ and we would be grateful for any items such as soap, toothpaste, tooth brushes, shampoo etc. Perhaps when you are shopping you could slip in an extra item or two which will make a difference to someone who has nothing. We would be most grateful and I will ensure that everything collected is delivered to Francesca personally. This month’s meeting will be on Tuesday 24th March at 7.30pm at St Mary’s church. Lotte Rule will talk to us about Macular Degeneration. All are most welcome. Thank you to all who contributed to the Alternative Christmas Card scheme at St Mary’s. We raised £140 for World Vision. The movement consists of a group of gardens, spaces or homes given over for a period of time to people who would like to reflect on the things of God in stillness and quiet. Fairways, Shaw Green Lane, Prestbury, is now affiliated to the Quiet Garden Trust. Those who come to this garden can use the time to pray, study God’s word, read, draw, paint, think upon God’s creation and relax. Please ring me, Rosemary Tadman, for further information on 01242 582826 or email . There is a summer house in the garden for cooler weather.